If you’ve ever loved dance, specifically ballet, then you know the name Nijinsky. What you are less likely to know is that the world-famous Vaslav Nijinsky had a sister who was also a dancer. 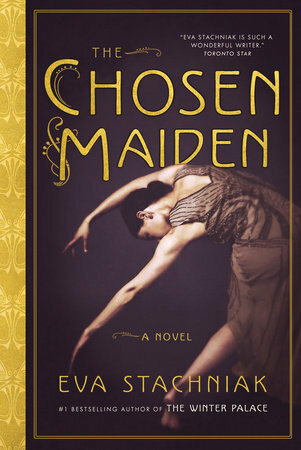 Thankfully, author Eva Stachniak rectifies that in her new novel, The Chosen Maiden, which is the story of Bronia Nijinsky. The novel begins when she is three and follows her life and career up until 1939 when she leaves Europe and moves to the United States. The Chosen Maiden begins prior to the Russian revolution, when Bronia and Vaslav are both students at the renowned Imperial Ballet School and dance company in St. Petersburg. While blessed with the Nijinsky family talent, Bronia does not fit the mold of a classical Russian ballerina. Instead of sylphlike fragility she is built for power. This means that dancing the lead in traditional ballets like Swan Lake is not likely. Luckily for her, a new direction begins to emerge in dance and ballets are created that are modern in feel and execution. Bronia is the embodiment of this movement and even as her brother is soaring to stratospheric heights she works steadily and is forging her own place in Russian ballet. I don’t want to be part of the world I believe to be dying. I want to be part of what is being born. The world of dance is the lead in The Chosen Maiden, but Stachniak uses the Russian revolution as the background for the novel to great effect. Prior to the upheaval, the Imperial School, funded by the Tsar, is where students were given over to their art, but also with all their needs taken care of completely. This is the system Bronia grew up in. Not long after she becomes a professional dancer that system is abolished and while the desire to dance is the same there often isn’t even enough food to cover basic survival. Add to that a political climate where anything and anyone appearing vaguely ‘elitist’ is going to be persecuted and artists like Bronia not only have to struggle to survive, but they have to worry about being summarily arrested and imprisoned. There are any number of reasons The Chosen Maiden is interesting reading, but one of the most appealing is that it is not your typical “sister-of” or “wife-of” historical fiction where the focus stays on the better known male character. Vaslav Nijinsky is not the focus in the novel nor does he have a place in the majority of the novel. Instead, the way Stachniak writes illuminates the fact that while his light may have burned far brighter than Bronia’s, hers was a steady flame that endured for much longer. Canadian literature for the win! I’m excited to read this (I have a copy in a pile at home) – especially the part about it not being a typical wife of, sister to novel. You know my feelings on those. i was a little bit worried. In November I bought a copy of Bolshoi Confidential and I think they will make for good companion reading. I definitely thought of you when reading this book. The brother is very ancillary- only when it involves Bronia. This sounds fascinating! I love historical fiction where the plot is shaped by world events that I don’t know much about.